The holiday season is upon us, which means time for food, family, fun and gifts! Though gift giving is not the only way to show that you care, why not give a healthy gift to a friend this year? If you know someone who has some back issues, or if you would like something to help out your own back issues, keep reading! We’ve got some healthy back gift ideas in a variety of price ranges to choose from. Foot orthotics can help correct an irregular gait by realigning the ankle. This realignment helps take pressure off the lower back. Though shoe insoles wouldn’t be the most impressive gift, if a person is suffering from lower back pain they could be exactly what is needed! You can even get them customized, now that’s a personalized gift! 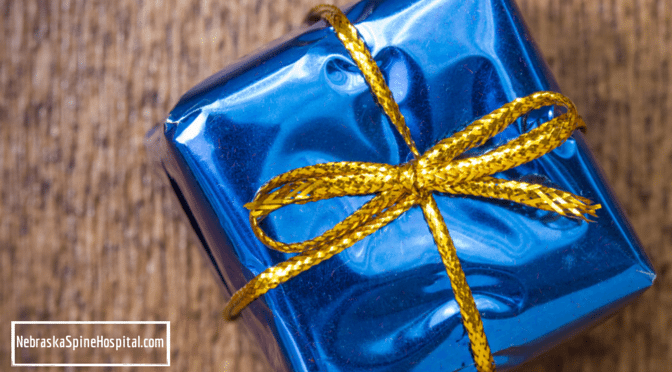 Yes, gift cards may seem impersonal, and they aren’t too fun to unwrap. However, if you have a family member who you know needs a little pampering but would never buy a massage for themselves, give them the gift of relaxation! There are even some chiropractors that offer unique chiropractic massages. And if you’re really tight for money, Groupon ALWAYS has massage deals to choose from, sometimes priced 50% lower! You’ve got a friend or a spouse who enjoys exercise, but a back injury has put them on the sidelines. Or maybe a loved one really does need some sort of physical activity, but lower back pain makes it uncomfortable to move. If you’re feeling really generous, why not give them a recumbent bike? This would be a more expensive gift, but this stationary exercise bike allows the rider to sit in a comfortable position and pedal at the speed of their desire. A person can read, watch T.V., or even type on a lap top while exercising. Price ranges vary. Available at Walmart, Nebraska Furniture Mart, Craigslist, and more. Be sure to sign-up for our monthly Healthy Back Newsletter for more tips to keep your back healthy. Please note that this is not an endorsement of any product or service.